This article is about Ganondorf's Final Smash. For his appearance as a boss, see Ganon. 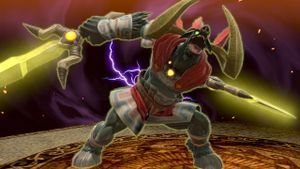 Ganon, The Demon King as it appears in Ultimate and Beast Ganon as it appears in Smash 4. Beast Ganon (魔獣ガノン, Demon Beast Ganon), also known as Ganon, The Demon King (魔王ガノン, Demon King Ganon), is Ganondorf's Final Smash. Beast Ganon in Super Smash Bros. Brawl. Ganondorf turns into Ganon, a gigantic beast resembling a fearsome boar, then stomps. If caught in the transformation hitbox, the opponent receives 10% damage and is buried. The stomp does 10% damage and paralyzes the opponent, even if they are in midair, with deceptively large horizontal reach in front of him. Beast Ganon then does a dash across the stage that does 47% damage. The move, if the dash hits, is extremely powerful, even strong enough to OHKO in some situations. If the dash misses, but the stomp hits the enemy in the air, they are very powerfully meteor smashed once the move completes, enough to OHKO if they are off-stage. Throughout the transformation, Ganon cannot be attacked. Soon after transforming, Ganondorf returns to his normal form, and appears back at the spot in which he used it. The player will not self-destruct with this move, as Ganondorf will still be in exactly the same position he was in before using it. It is generally ideal for a player to use this Final Smash at the boundary line of the screen, as otherwise opponents can get behind the player, thus avoiding the move. In Super Smash Bros. 4, the Final Smash is weaker than in Brawl, no longer able to OHKO, the dash deals 7% less damage (down to 40%). 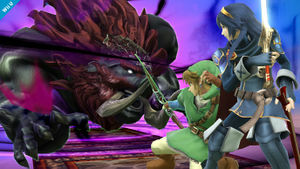 A purple tint is added in the background when the move is activated, and Ganondorf roars triumphantly upon transforming back into his Gerudo form. In Super Smash Bros. 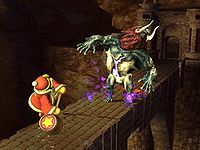 Ultimate, the attack functions largely the same, but Ganon's appearance is based on his Ocarina of Time version and has another name as Ganon, The Demon King. Instead of stomping, the Demon King strikes the ground with his twin greatswords to a similar effect, paralyzing and meteor smashing opponents. If the opponent is far enough down when they are struck by the greatswords, Ganon can miss and the opponents will be properly meteor smashed. The dash's damage was increased to 45%, but the move was overall nerfed again, with the removal of the hitbox that occured on transformation, the horizontal reach of the meteor smash hitbox being severely reduced to no longer go past his twin greatswords, and the dash now possessing a sourspot at the start that does 35% damage. Beast Ganon fighting Midna and Link in The Legend of Zelda: Twilight Princess. Ganon is Ganondorf's original beast form, which debuted in the first The Legend of Zelda game (although misspelled as Gannon) and made several reappearances in later games. Ganon's appearance in Brawl and Smash 4 is based on his The Legend of Zelda: Twilight Princess version. In Twilight Princess, Ganon's only attack involves trying to ram himself into Link. In order to stop Ganon, Link must shoot an arrow at Ganon to stun him. Ganon would fall to the ground where he leaves a glowing weak spot on his chest vulnerable to attacks. Link then must attack that weak point until Ganon gets back up, and continues with the cycle. The glowing weak spot on his chest is also retained, but it does not affect Ganon when attacked. Beast Ganon fighting Link in The Legend of Zelda: Ocarina of Time. In Ultimate, Ganon appears as he does in Ocarina of Time. Here, he would attack Link by striking with twin swords. To defeat Ganon, Link must strike at the beast's glowing tail, Ganon's only weak spot. After enough strikes, Ganon would crumple to the ground which gives Link the opportunity to deal a finishing blow. The Final Smash's new name—Ganon, the Demon King—is a title given to Ganon throughout the Zelda series, particularly in Ocarina of Time. Ganondorf's Final Smash. When he grabs a Smash Ball, he transforms into a repulsive, evil beast. He'll vanish momentarily from the screen, then rampage from one side to the other in a straight, headlong rush. When he begins the move, any character before his eyes will flinch, so try to start the move near other characters. For Ganondorf's Final Smash, he morphs into a beast and attacks. As soon as he's transformed, he buries nearby fighters in the ground and then stuns them with his roar. Finally, he charges forward, dealing heavy damage and launching anyone in his way. Any foes buried by the first strike are doomed to be hit by the rest. For Ganondorf's Final Smash, he morphs into a beast and attacks. As soon as he's transformed, he buries fighters nearby in the ground, then stuns them with his roar. Finally, he charges forward, dealing heavy damage and launching anyone in his way. Any foes who are buried by the first strike are guaranteed to be hit by the rest. Beast Ganon's attack in Brawl. Beast Ganon in Super Smash Bros. for Nintendo 3DS. Beast Ganon in Super Smash Bros. for Wii U.
Ganon, The Demon King as shown by a Skill Preview in Ultimate. Ganondorf's T-pose after using Beast Ganon in Brawl. Although Ganon has the same glowing wound as in The Legend of Zelda: Twilight Princess, it has a purple tint around it, rather than just being white, like in Twilight Princess. If the player who is Ganondorf pauses while Beast Ganon is dashing across the screen, the camera automatically focuses where they were standing when they activated the Final Smash. This could mean that, programming-wise, Ganondorf himself does not actually move, but is animated to disappear and reappear at certain points while the separate Beast Ganon model moves and attacks. If the player pauses just as Ganondorf returns from the attack, he will be in his default character model pose (the T pose). Alternately, if the player pauses just as Ganondorf begins the attack (before he transforms), a very tiny Beast Ganon can be seen near his neck. If he is bending down, it will be more noticeable, and inside his cape. The move's special effects can reveal very odd light-warping effects if looked at from the proper angles with the pause camera. At certain angles, a character can appear to be looking in a distorted mirror. For Brawl, Ganondorf's Final Smash was revealed before the actual character himself. Prior to Ultimate, Beast Ganon was the only The Legend of Zelda-based Final Smash to be used by only one character. There is a glitch in Brawl where if Beast Ganon is activated at the very edge of the Blast line, the camera freezes along with Ganondorf in his invisible state. He is then unplayable for the rest of the match. The aftermath of the glitch can be seen here. Beast Ganon's dash travels extremely fast, surpassing all characters' dashing speeds and other rushing final smashes. Beast Ganon, Poltergust 5000, and Power Star were the only final smashes to be renamed yet functionally unchanged in a subsequent release. This page was last edited on March 19, 2019, at 22:48.